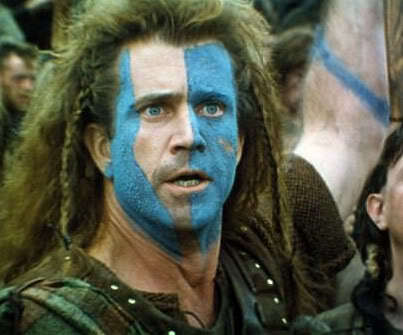 Blank Document Braveheart > Pen to page. Think of the children. I was supposed to get on here and rant about characterizations, or even tell one of my stories since I have a good one.. but. When I started this whole gig I didn’t call myself a writer. Even after being published the few times, I only dabbled. The label “Author” brings to mind the likes of Stephen King and not yours truly so I stuck with mumbling, “I write sometimes, yeah, sorta, no big deal.” And I still do. Often times, I look in the mirror and ask myself questions. What? I get the best advice from that chatterbox on the other side. She is smarmy but talks long enough that eventually she says something of value. My question: Why do I do this? If I am a barely there writerish person who is not serious about it all then why put the pen to pad? My mirror gal sat up a little straighter, dipped her quill a few times and said, Why not? Now don’t get all soft on me. I’m not one of those people who gets all emotional about my writing (sniff). But if I were… Here is what I would say. The younger Logan walks into a bar. She spots a muscular mail man across the room.. Wait, nope, that’s the other blog. (backspace backspace backspace) Ok this Logan, the younger version who’s penned a few stories. She doesn’t think much of them, but her drunken Aunt raves about her talent and offers to pose for her cover. She’d posted one of these onto an old site Logan prowled in her early writing debut. Checked back every once in a while for reviews… or that is to say every three seconds until comments popped up. And then, right then, it dawned on me—not at all. I answered back some kind of “ok thanks” and moved on never knowing how that one review planted a little seed in my barely writerish mind. Over the years I’ve spoken about this art to people from all over the world, even having to use a translator a few times. And it all didn’t hit me until recently. When I put a story onto the page, and it goes from here (taps my head) and through my hands onto the keyboard, it fills up the empty space on that little blinky white page, and it floats away from me into the universe. It looks so ordinary. I look so ordinary. Just me and my fingers tapping away like a fat little pigeon (Mama from the train reference there). It stretches its little legs and runs. Sometimes a little closer to home than I’d like but no matter the story makes its own way in the world. So this dude overseas, tired, hungry, maybe even in a bad mood and for one moment, just one single teeny bit of time, maybe just maybe, I could give him an escape. My story lit his place on the other side of the planet. Glowing like a beacon, Read me! What if I could make him smile or cheer on my hero? What if I could make him intrigued so that his stress and cares melted.. even for a while, away. What about a gal fresh off a divorce, funeral, tax appointment right around my block? What if one of my jokes made her giggle at my silly character or shake her head ruefully at their argument? What about the guy who had stroke or put his dog to sleep? What if he clicked on my story next and thought my character had such an uplifting outlook, a fighting spirit, that against all odds he or she could really put it to this thing called life and so, so could he. I found out my words were like a handshake. They stretched like a long arm across the continent, the seas, and firmly pressed into the palms of a perfect stranger. They said “How you doin?” Ok for real though some of our stories are more like twerking in their kitchen, but either way it’s you. YOU! Not here. THERE! And them. For a while. That reader is all yours. If you reach them in the sick ward, in the throes of anxiety, depression, joy, exhaustion, hyper, young, old, white, black, green, and pink. That’s not just writing folks. Don’t be stupid. Write what you know: My new release! Unfortunately we have to decline your story “Dark and Dreary”… !!!! !My release is out!!!!! Jeez Louise this was good. Hot damn. I was feeling a bit nostalgic today lol. Thanks! This is one of the best blog posts I’ve ever read pertaining to writing, end of punctuation. Lovely. This is why some Logans get asked to contribute to anthologies, and some do not! And she’s got a story in my troll book. Just sayin’.